"A BALANCED DIET IS A COOKIE IN EACH HAND!" If you LOVE pineapple, you’ll love this! We are now at the end of our journey. Julie Powell is #50 on Gourmet’s list of the 50 Most Influential Women in Food. For those of you who don’t know who Julie Powell is, she is the author of the Julie/Julia Project, a blog chronicling her endeavor to cook through Julia Child’s cookbook “Mastering the Art of French Cooking”. Julie was born and raised in Austin, Texas. She graduated from Amherst College in 1995 with a double major in theater and creative writing. After graduation, she and her soon to be husband Eric Powell, moved to NYC. He became an editor for Archeology Magazine. She began working for the Lower Manhattan Development Corp. Hating her job, and feeling like she was at a dead end, she started her Julie/Julia Project trying to find a voice for herself. Her blog quickly acquired a large following, and Julie was offered a book deal with Little Brown and Company. The book titled “Julie and Julia: 365 Days, 524 Recipes, 1 Tiny Apartment Kitchen”, was published in 2005. Julia Child was not a fan of Powell’s blog. Child’s editor, Judith Jones, said in an interview: Flinging around four-letter words when cooking isn't attractive, to me or Julia. She didn't want to endorse it. What came through on the blog was somebody who was doing it almost for the sake of a stunt. She would never really describe the end results, how delicious it was, and what she learned. Julia didn’t like what she called 'the flimsies.' She didn't suffer fools, if you know what I mean. In 2009, her book was adapted into the movie Julie & Julia, which was also based on Julia Child’s autobiography "My Life in France". The movie was directed by Nora Ephron and starred Meryl Streep as Julia Child and Amy Adams as Powell. Powell set the bar for the way food blogs are today! For Julie, it was not about her cooking as much as it was about her wit and chatty nature. Thousands loved reading what she had to say and followed her cooking journey! Julie has made appearances on national TV shows such as ABC’s “Good Morning America” and CBS’s “The Early Show”. She also appeared on “The Martha Stewart Show and Food Network’s “Iron Chef America”. Her writing has been in numerous magazines and newspapers including Bon Appétit, Food and Wine, and the New York Times. She has also been a two-time James Beard Award winner. Julie was also awarded an honorary degree from Le Cordon Bleu in Paris. For anyone who would like to read Julie's original blog, which has been archived, you can find it here! I chose to make Julia’s Flan Des Isles (Pineapple Custard). After trying this, my husband said, “ This is not a keeper”! I guess that pretty much sums it up! I actually thought they were pretty good, I just expected more custard! I thought the pineapple was overwhelming. The recipe calls for 2 ½ cups of crushed pineapple. I was expecting more of the creamy texture of custard or flan. If I were to make this again, I would cut the amount of pineapple by half and, use the same amount of juice. I still enjoyed it…but for my husband, not so much! to a boil. Boil slowly for 5 more minutes. Beat flour and lemon juice in a mixing bowl with a wire whisk until blended, then beat in the kirsch or cognac, and the eggs. Gradually beat in the hot pineapple mixture in a thin stream of droplets. Remove mold from water, let cool, then chill for 3 to 4 hours or overnight. high heat until the sugar is melted. Then let the sugar boil, swirling the pan occasionally, until the syrup turns a light golden color. Remove from heat and immediately pour into the custard cups, just enough to cover the bottoms. Our last post as a group…Thanks Mary for a great journey…I will miss cooking along with all these talented ladies! Please check out their wonderful blogs to see what they’re up to! It has been an inspiring experience cooking along side all of you ladies over the last year. Kathy, the Flan Des Isles looks beautiful :) You do such a wonderful job on all of your cooking projects. Thanks for the interesting story about Julie and Julia. I saw the movie, but I must read Julia Childs book, "My Life in France." I do adore pineapple - so maybe I will love it as is? Lovely posting. Sad to see the gourmet-changers go but I have met so many new chefs, recipes and inspirational bloggers that it has been a grand journey. Kathy, while your post is very nice, your photos are EXQUISITE!! I hope I am not smearing envy all over your lovely blog! It has been a pleasure traveling down this blogging road with you and the other ladies chronicling the 50 change makers in food. I will miss checking all of the posts on Friday mornings. Kathy, beautiful photography! The flan does look delicious and light and that caramel looks just perfect even if you were not totally happy with this recipe. And you wrote a wonderful post about Julie Powell! Caramelized sugar + Pineapple + creamy custard = OH YES! Seriously amazing choice of food to end our time with these fabulous ladies. I had a wonderful time with all of you! Kathy, looks can be deceiving. It looks amazingly delicious, but you're right about the custard. It's not a flan without the custard. I've had a wonderful time with the group but I'll still be checking to see what you're up to. This is such a great epilogue to this beautiful event Kathy! The flan looks so mouthwatering and pineapple is so appropriate for this time of season! What a shame your husband didn't love it, it looks delicious! I'm so far behind with my commenting, that I forgot all about this super yummy flan-custard. Love the pineapple addition, and the caramelizing is just perfect...saliviting here just looking at the photos! Kathy, I have loved reading these. 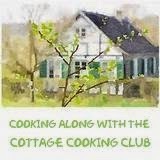 A most interesting series of women and recipes. My goodness, what you have learned. And, since I am reading through them all, slowly but surely, I am learning also. I like pineapple so might give this a go. Pineapple in flan sounds delicious, but it does look like it is chunkier than the usual flan. We’re Back With Cook the Books Fridays and Dorie Greenspan’s New Book!